A live performance of Mahler's Symphony No 6 with Daniel Harding and the Symphonieorchester des Bayerischen Rundfunks. It is Daniel Harding's second recording for the label BR-Klassik after Schumann's Scenes from Goethe's "Faust". The cover shows the heartbeat of the percussionist during the finale of the symphony. It is regarded as his most radical symphony, is nicknamed “The Tragic,” and ends in a hopeless minor key. In his Sixth Symphony, Gustav Mahler created a gloomy musical world-view for himself that, on the surface, seemed quite at odds with the happy stage of his life in 1903/04 when he wrote it: he had married Alma, had two young daughters, and was the successful director of the Vienna Court Opera. Dark clouds were already on the horizon, however. As Alma Mahler later reported, the three spectacular hammer blows from the original finale of the symphony were the harbingers of Mahler’s own misfortunes: the death of his daughter, his resignation from the Court Opera, and the diagnosis of the heart disease which eventually caused his untimely death. The Sixth was then premiered with just two blows of the hammer, on May 27, 1906 in Essen. With this recording, following Schumann’s Faust Scenes (BR-KLASSIK, 900122), BR-KLASSIK presents a further production with Daniel Harding, who counts Sir Simon Rattle and Claudio Abbado among his teachers and, since 2005, has made regular appearances with the Symphonieorchester des Bayerischen Rundfunks as its principal guest conductor. 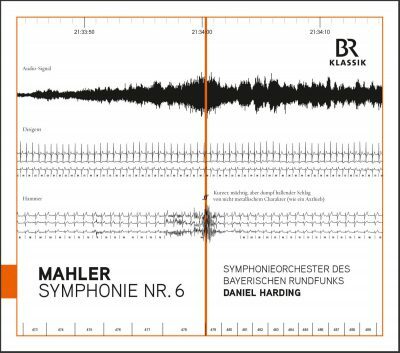 In 2014 this fruitful collaboration produced the live recording of Mahler’s Sixth Symphony, performed in Munich’s Philharmonie im Gasteig. Daniel Harding here reveals himself to be a Mahler interpreter who is adding to his previously scarce Mahler discography with selected, carefully planned individual works, based on broad experience from numerous live concerts. With the Symphonieorchester des Bayerischen Rundfunks, he encounters an orchestra that has been among the pioneers of Mahler performance ever since the Kubelík era of the 1960s, and has produced several great Mahler symphony cycles since that time.